NASA chose Gale Crater as the landing site for Curiosity, the new Mars Science Laboratory rover, because the crater contains a variety of water-related minerals and features. These enhance the likelihood of the rover finding geological deposits with organic compounds, a key ingredient in the search for life, past or present, on Mars. Gale Crater spreads 154 kilometers (96 miles) wide, and it contains a 5-km (3-mi) high stack of layered sediments. Scientists estimate the crater formed by a massive impact 3.5 to 4 billion years ago. However, the origin of the layered sediment stack, dubbed Mt. Sharp, is unknown. The Thermal Emission Imaging System (THEMIS) is a multiband visible and infrared camera on NASA's Mars Odyssey orbiter. 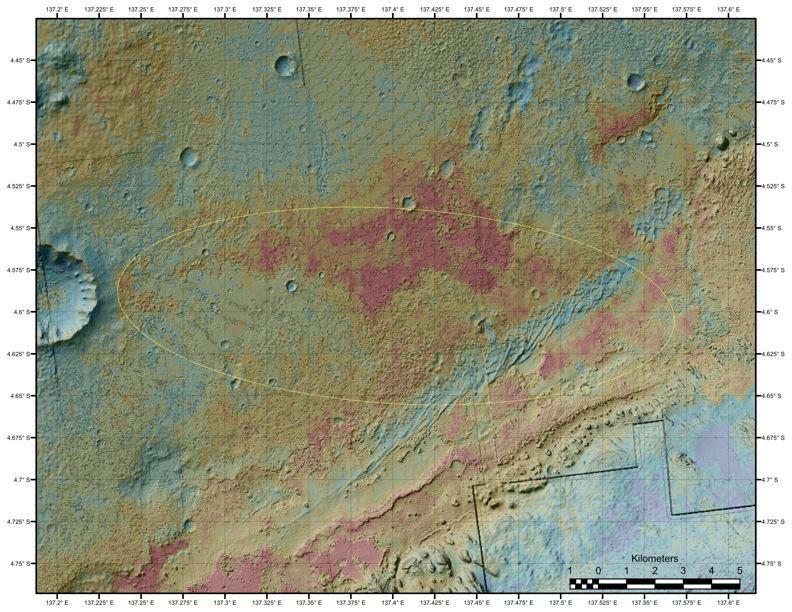 THEMIS has produced data about the surface materials on the Gale Crater floor that Curiosity's science team is using to map locations that may become early targets for the rover's instruments. THEMIS imaged the crater by day and night at heat-sensitive infrared wavelengths. The contrast between day and night temperatures indicates how soft or hard the ground is. Surfaces with sand, dust, or other fine-grain materials cool off quickly at night, while outcrops of rock and hardened sediments cool more slowly. Researchers then combine day and nighttime views and apply false colors to map the different regions. Fine-grain sediments appear in cool colors, harder materials in warm tones (see at right). The landing ellipse for Curiosity touches a feature geologists have mapped as an alluvial fan. Similar to alluvial fans commonly found in desert regions of Earth, it formed when water flowed through Gale's northern rim and washed sediments onto the floor. Within the ellipse, but just beyond the farthest edge of the fan lies a broad patch mapped in reddish tints. "We're not sure what these materials are made of," said Project Scientist John Grotzinger (Caltech), head of the science team, at a NASA press briefing, August 2, 2012. "But they could be loose surface materials that have become cemented by water from the fan." Curiosity will land somewhere within the oval outlined in yellow. The rover even has a good chance of actually landing right on top of the sediments. And even if it doesn't, notes Grotzinger, these materials will lie within a short drive and will be visited soon after the landing. Said Grotzinger, "It all suggests we've got some cool geology to explore." 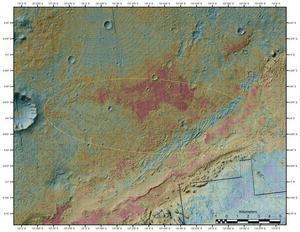 In this false-color view, reddish tints map where THEMIS found hard sediments on the floor of Gale Crater. These may have been cemented by water that created the alluvial fan at top center. The yellow oval marks the area where Curiosity will land.